So, I’m writing this blog topic because it seems to be a seasonal issue that comes up in my household a lot. Whether you reside in an apartment, condo, cottage or mansion, the size of the tree you select for the holidays should really be suitable for the space that you live in. Why am I bringing this up? Because many people become a bit overly exuberant when the time of trimming comes upon us, which can sometimes affect our selection process. Don’t get me wrong, I enjoy the crisp clean scent of pine wafting through the house for a couple of weeks and hanging heirloom ornaments that have been cherished over the years but isn’t the height and diameter of our Christmas stage a factor to consider? With minimal space, you’ve got to be realistic and opt for trees that will ACCENTUATE not ARROGATE your living space. 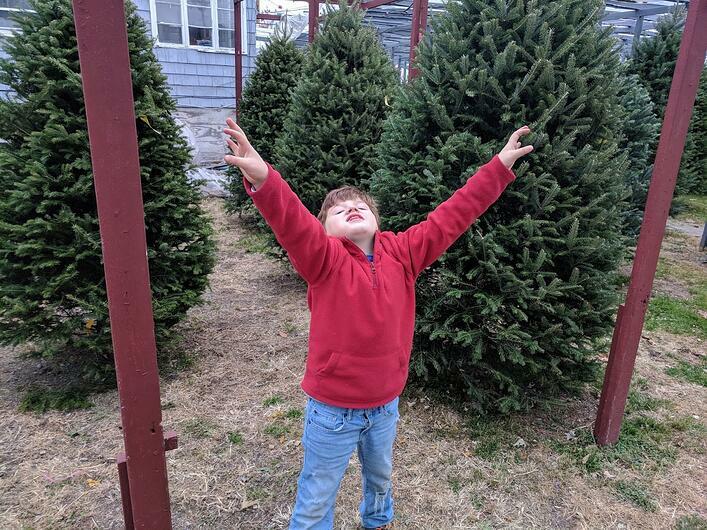 I get it-you love the yuletide season and finding the biggest, baddest tree in the lot has become an activity you look forward to but you’ve got get real. That sucker is going to be in a living room, dining room, sitting room or wherever for a good chunk of the month and finding the right size is imperative to continuing the household’s routine functionality. Dragging home a whopper that is seven times the build of the dinky corner you’re planning to set it up in can only lead to disorganization, tipping accidents, dry out and even fires. You don’t have to be Clark Griswold to celebrate the holiday in style by mowing down a fir that a cathedral couldn’t even host! Think about where you’re really putting the thing and then browse your options from there. You should also be thinking about the comfort of both you and OTHERS who you’ll be sharing the holidays with since someone’s going to be cleaning up a whole lot of needles for the next month. If you’re not sure what the right size tree is, ask one of the guys that are working the lot because they have a pretty good idea when it comes to Christmas tree etiquette. If you want, print this out and take it along with you to help make your decision easier and wiser! My first apartment wasn’t huge but I always had a perfectly trimmed tree that fit beautifully in my living room. This ½ pint adorable pine is all you need to dress your place up for the holidays! If you are lucky to live in a warm cottage, you might want to think about this size since it is completely reflective of the charm of your home. Not to big, not too little but just right! If you live here- GO FOR IT! Go check out the monster trees that could only probably fit in the entrance of a mall and light that sucker up! A plentiful variety of orchids are being featured in designer magazines where their customary implant within urns and vases are extending into other areas of Christmas grooming. While the tropical flowers still remain as a substantial part of December centerpieces, they’re also being used as trimming for the tree! If you think about it, this is a clever idea for several reasons including their impressive longevity when placed in water tubes and the wide spectrum of color available from most species. You may have seen flowers such as roses and baby’s breadth hung from balsam boughs in previous years but this new implementation of fancy fleurs is sure to turn heads and outlast past varieties. Flower lovers have always adored the idea of pruning with their favorite blooms but are often disappointed by the cost and maintenance. 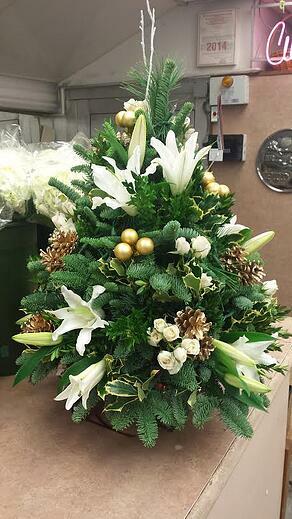 If fussy flowers are chosen as ornaments, the upkeep to maintain a lively looking display for the duration of Christmas may prove extremely difficult. That’s why orchids are the solution to this problem and can be enjoyed long after the season if cared for properly. Here’s a list of favorites that are sure-fire winners for vase and tree trimming this holiday season. Not only are these orchids strong and resilient against heat and cold, but they are also grown in the perfect hues for Christmas-chartreuse green and white. The heads make them noticeable among other ornaments as well and provide an interesting conversational piece for guests. Phalaenopsis are one of the most popular orchids around the world and due to its impressive beauty, there’s little argument as to why. A single head is large enough to be placed in the tree alone or you can choose large branches to drape across the branches. White remains the most requested color, although this species also comes in shades of pink, yellow and peach. 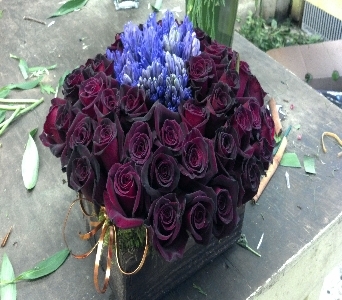 If you really want to get creative, inquire from your florist options for dyed heads. This is another great option due to its coloring, which is deep red or crimson. The florets are shaped as small stars that are delicately grown up a slender stem. Designers are most likely to place James Story in water tubes and use along side other orchids that are white or brightly colored. Christmas is the season for time-honored traditions experienced with friends and family. We mark this special occasion by decorating with particular items in order to make our homes feel festive for ourselves and for those who visit. Twinkle lights, wreaths and trees are in high demand throughout Boston and are slowly appearing on doors and spotted within windows. Just by driving by a house lit up by tiny rainbow bulbs, many of us experience a feeling of uplift and immediate joy. Holiday décor plays a very strong influence upon creating the magic that the Yule Tide brings and the emotions that effervesce from these beautiful signs we associate with Christmas. Every year, families partake in seeking out these novelties but have you ever wondered where the traditional influence began? Find out what makes a balsam a Christmas tree and why a circle of garland eventually resulted into a holiday wreath. You may just be surprised how these icons earned their fame and resulted into our most cherished seasonal ornamentation! Here’s an interesting fact: Did you know that Christmas trees are the only single variety of arbor grown in all 52 states? Yup- and that even includes Alaska and Hawaii! Balsam, spruce and fir species are the #1 cultivated species in the U.S. and that’s all because of our love for Christmas! Historically, there’s a ton of stories claiming the truth behind the Christmas tree but the one I like best is the tale about how the ancient people in the northern hemisphere celebrated the winter’s solstice, (the longest day of the year). They believed that the Sun God had cyclical levels of feeling well during the warmer season and weak during the cold. On December 21st, there would be a celebration for the Sun God because it was the end of her “ailing term” (the cold dark nights) and the beginning of her health once again (the return of heat and sunlight). The people would mark this occasion by using pine and evergreen boughs to hang in their homes as a gesture for an early spring arrival. They chose pine because it held its bright green color throughout the year. The early Vikings and Romans also implemented a similar ritual when they displayed Christmas trees as a sign of continued health and everlasting life. As you can imagine, wreaths have been used as a symbol throughout time holding both a positive and negative implication. Depending on the culture, region and religion, this icon could be gifted as either a token of victory or hung as a sign of death. In “Christmasy” terms, the shape being a circle is typically tied with unity, everlasting love and “infinity” depictions, almost always recognized as a pleasant connotation. As you might see today different styles woven out of berries, twigs or branches, the wreath is traditionally made with pine bows because past civilizations sought after its unchanging green hue. 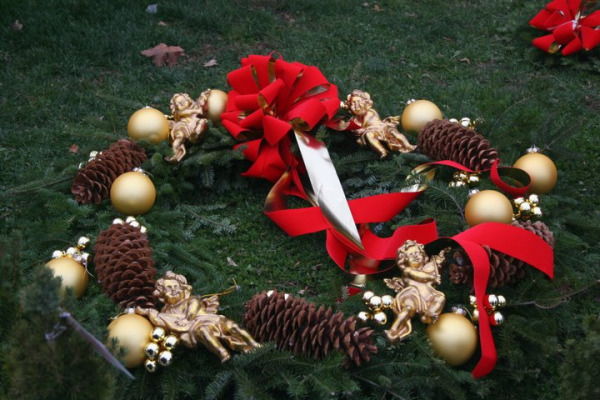 If you’re Catholic, you might be interested in knowing that the wreath became associated with Christmas after the resurrection of Christ as it became used as a sign of eternal life. The holiday season can be a wonderful time for most but for others, there’s a lot of stress and hard work involved. If you’re a local flower shop, you really understand this statement. Florists have to move a ton of product just to pay for the increase in overhead during the month of December due to heating, staff and wholesale product prices. For the larger floral operations, they have competition against supermarkets, truck stops and even buy-in-bulk stores like Cosco. There’s a constant price war and in the end-you’re lucky if you can break even. For the smaller flower shops who are struggling to sell their red amaryllis and rose arrangements, they too battle against lower quality look-a-likes sold by neighboring entities who can shove a few poinsettia plants in the window and call themselves a greenhouse. Plain and simple-it’s a tough time of year for these guys so they need to do everything they can to attract customers. Thankfully, they’re doing a great job because business proprietors and employees have allowed themselves to think outside the box. 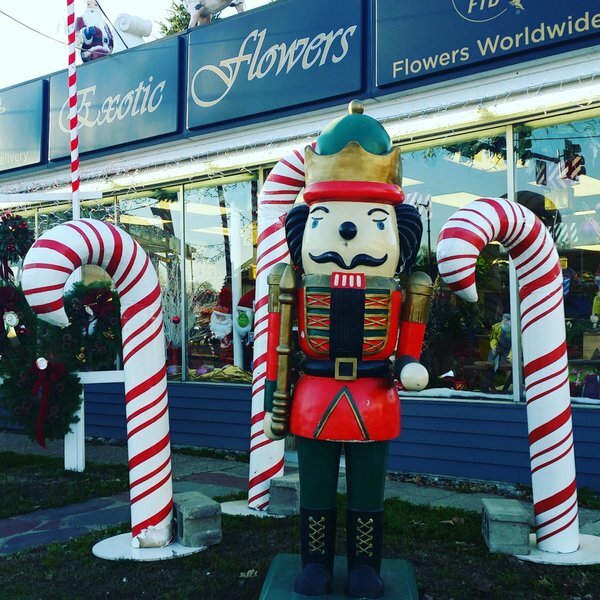 With creative ideas that work to relax, enchant and excite potential patrons into choosing their store over the others, floral companies are effectively overcoming the saturation of the market during Christmas and are winning back the prestige of their seasonal décor as they should be. Here’s a few ways that are setting these guys apart from the rest! Music is the number #1 stimulator that encourages the emotion of happiness. Plug in those speakers and fire up Nat King Cole, Andy Williams or even “Alvin and the Chipmunks Holiday Sing Along” to alleviate tension and increase the spirit of the season! Both your customers and staff will thank you. When you have something cooking in the oven, the scent works its way into our neuro-system releasing anxiety and frustration. When the food baking is something sweet, the effects are quadrupled. Offer a nice plate of Christmas cookies to all those who enter your store and make sure you have both gluten and sugar free options for those who prefer an alternative to sugar or have dietary restrictions. There’s nothing like watching a flocking machine do its magic on a tree farm! 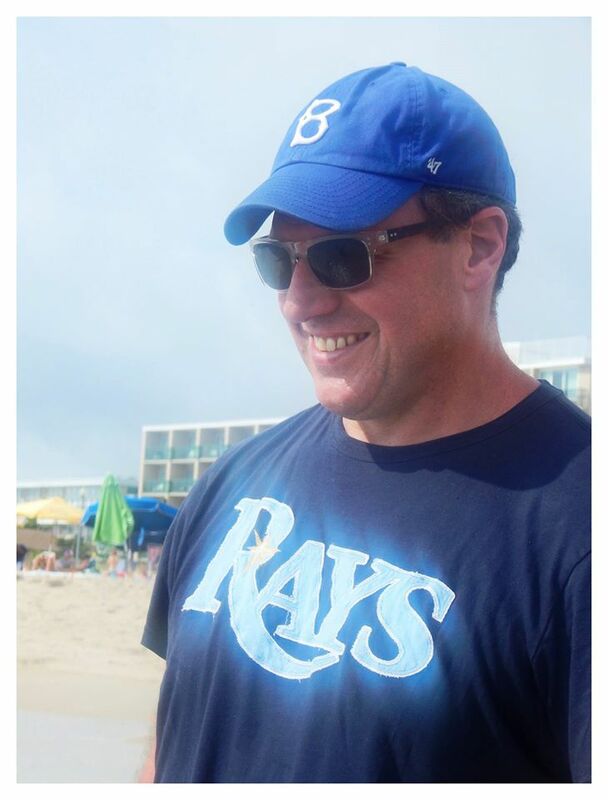 The buzzing sound coupled with the white flakes floating up in the air can make anyone smile so if you’re on the fence about making the investment-go for it! It doesn’t matter if the lights are rainbow-colored, blue, purple, white, red or silver- bulbs are a must when decorating your business for the season. The effect promotes a sense of ethereal and softness curtailing those moods that might be a bit brittle during the month of December. Do you realize that the people who choose your shop to do businesses with during this season are also welcoming you into their holiday celebrations? Your entity has become a part of their family’s festivities just buy purchasing the perfect Christmas tree, poinsettia plant or pinecone centerpieces from you! Grab a person who works for you and put them in a Santa Suit! They don’t have to look the part, but they do have to smile and say “ho, ho, ho!” You wont believe how excited the younger customers will be and what it does for your company’s environment as a whole. Don’t Forget It’s Called the “Season of Giving”! They don’t call it the “season of giving” for nothing, you know! Contact your local non-profits and donate a few vases and plants for elder and homeless dinners or even ask your local library if you can participate in a free flower arranging demonstration! You’ll feel great and you might even stir a little interest you way! The outside lights are twinkling-check. The holiday cards have been sent-check. There’s only one thing left to buy for decoration and that could only be…The Christmas Tree! 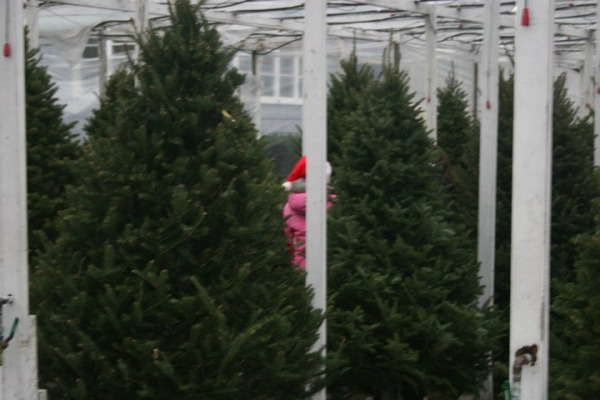 Lucky for Bostonians, we have many tree lots within our vicinity, which carry several different species along with affordable ornaments and lighting options. Depending on your budget and preference, you’ll surely b e able to find the ideal specimen for your home to enjoy throughout the season! snow flocked trees at Exotic Flowers in Boston. We had a lovely time over December, hosting parties, serving delicious cuisine and opening up presents underneath the Christmas tree. It was magical, right? But how on earth do we even begin to cleanup the mess that’s accrued in our house during the holiday season? Honestly, it can be a tad bit overwhelming as to where to begin such a process! There’s the lights, ornaments, special dishware, linens, Santa Claus figurines, Nutcrackers, stockings, garland, wreathes and last but not least the tree to remove so how do we get it done? Don’t feel overwhelmed, there is an organized system for Christmas cleanups that will swiftly and safely get your home looking the way that it did pre-holiday season. So take a deep breadth, roll up your sleeves and get cracking! 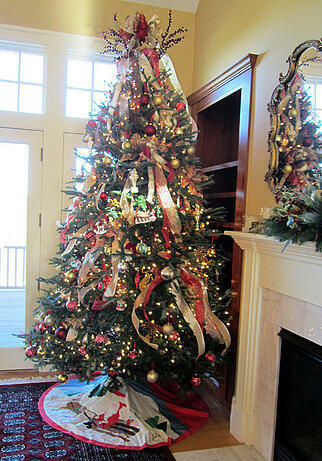 The first thing that you should do is carefully remove the stand and all of the ornaments from the tree. Decide which can be stored and which should be disposed of if perishable (example: children’s cookie cutter ornaments or fruit based ornaments). Carefully wrap those that are delicate or highly breakable to avoid shattering and then place in a clearly marked box, “Tree Decorations”. Remove the lights off all branches and either throw away or wrap tightly for next year. Whether you are planning to toss the arbor into the forest or bag it for the town to collect, lights are non-biodegradable and need to be removed in a responsible manner. Boston Public Works will be collecting trees for composting from December 29, 2014 to January 9, 2015. If you leave it on the curb on your recycling day without placing it in a bag, they will handle it for you. Once the tree is taken care of, it’s a piece of cake. Get your broom out and do a preliminary sweep of the area to get the bulk of the needles and then do the final pick up with a vacuum cleaner. 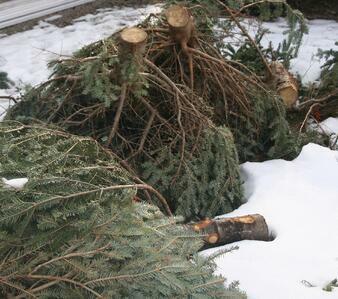 It will cut down exploding bags full of pine and brooms are an energy efficient “green” method of cleaning. 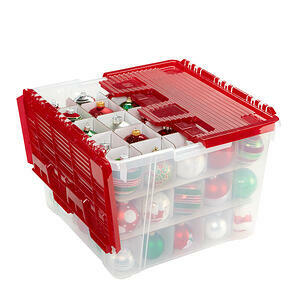 Next, pack away the left over Christmas nick-knacks in containers that have labels, you wont want to be blindly searching in the attic next December. Remove all other greenery including wreathes and garland by placing in an environmentally suitable location (again, with no non-biodegradable items attached) or contact the City of Boston for suggested trash sites. Once this has been accomplished, find all tablecloths, hand towels, napkins, table runners, Christmas dishware and any other washable fabric thematic after the holidays and do a thorough cleaning. After they are sparkling, store with the other decorations or in a moisture-free space where they can be used again for years to come. Last but not least, give yourself a pat on the back for a Christmas Cleanup well done! Suzie is incredibly organized and always has her Christmas down before the New Year. 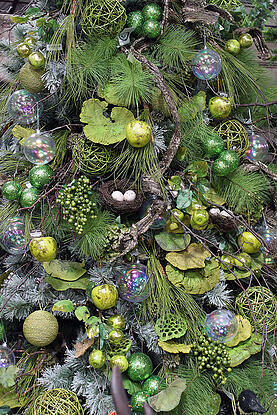 It’s about that time to break out the ornaments, eggnog and yes, the Christmas greenery! 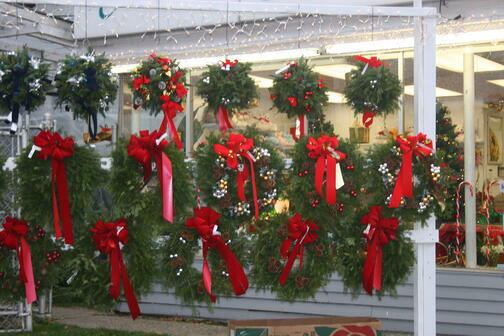 Florists are busy this time of year with an extensive line of holiday products just perfect to spruce up your home. Worried that your budget can’t handle the extra expense of centerpieces and roping? Don’t be! Boston designers have all you need to fit anyone’s spending guidelines. Many are actually unaware of the multitude of choices that they have access to during the month of December, holding the presumption that trees, wreathes and roses are their only options available to them this time of year. Well, nothing could be farther from the truth and to convince the hesitant floral buyers, you wont believe these stunning holiday décor pieces that I’ve come up with just for you! Boxwood trees are lovely compliments to your regular Christmas decorations and provide an authentically elegant appeal for holiday parties and festivities. Produced in a variety of different sizes and themes, box trees can be purchased plain or with ornamental accessories, although trust me, they are equally as stunning. Florists are clever in they way they are constructed by placing balsam strips into a preformed structure of oasis making them durable and healthy for a long period of time as long as they are watered consistently. Box trees are perfect either dispersed throughout the home or placed in the center of the dining table, making it an excellent fuss-free option for centerpieces. Kissing Balls may seem traditional but have remained one the most frequently requested items from Boston florists. Shaped in a ball of balsam, some designers have put their own signature stamp on the piece by adding tiny pine cones, dried flowers, white lights, ribbons and even round sparkle gems. Historically kissing balls were used to instigate a smooch from couples standing beneath one, (resembling the mistletoe effect) but nowadays, many are hung in front of houses in replacement wreathes. Again, these simple but charming Christmas florals are both inexpensive and easily maintained to last throughout the entire season. Contemporary Christmas flowers hold a traditional appeal but possess a modern presentation for the Christmas lover dying to create outside of the box. Most of the time, this consists of changing one aspect of the arrangement such as replacing a clear vase with a vessel wrapped in birch bark or using a bright flick of orange to break up the ho-hum red, green and white holiday palette. Berries are another wonderful option for those wanting to design a piece themselves. Since there is an abundance of pinecones, fir greenery and wild bittersweet growing naturally in the New England habitat this tie of year, these are extremely easy to find and are less expensive than some of the harder to find and imported flowers. You can be sure to see orchids at Suzie's home in Westwood at Christmas time. Tree decorating is one of the most time-honored traditions during the holiday season where families and friends gather together to prepare their most important centerpiece for the Christmas holiday. Decked out in ribbons, pearls, heirloom ornaments, popcorn and stars, we see some of the most stunning and imaginative Yule tide creations which represent our personal interpretation of the beauty of Christmas. The interesting part of this tradition is the fact that no tree is exactly alike and holds their specific theme within the décor of their branches. Around the world, people intertwine their vision with baubles, sparkle and lights, swaying away from the customary palette of red, green and gold. Contemporary decorators see no fault in purveying a new and unique embellishment for their seasonal balsams and why shouldn’t they? Don’t be afraid to mix up the motif this year by adding a modern flair of imagination! Here are a few suggestions that may help to get your creative juices flowing. Hot pink, orange and lime green. Yes, it might sound a bit risqué but I assure you this color combination packs a “wow” factor punch particularly when hosting a Christmas soiree. The element of bright and cheery is reflected when using these pigmentations together and can be easily accomplished by using simple accents throughout the tree. Hot pink roses, baby tangerines and limes make affordable yet glamorous ornaments that are guaranteed to stun and awe onlookers. If you feel that this style might be perfect for your holiday party but a little too much for everyday appearance, you need only to substitute the hot pink pieces for shades of cream, blue or silver which pairs well with the remaining tones. Although ornaments are traditionally crafts that represent the holiday season such as icicles, tinsel and bows, there’s no reason why you can’t utilize objects that you love to become display items as well. For example, a woman collected fine pieces of doll set china and wondered if she could use her beloved treasures to decorate her Christmas tree. She soon figured out that many of the items could be hung with string or easily tucked carefully and securely within the pine needles. Another family who loved animals and had several dogs and cats decided that they would represent this special adoration by placing their pet’s paws in a molding clay, creating a print and then poking a whole at the top to be strung. There was even a boy who enjoyed folding origami and thought that the clever projects he made would be a wonderful theme for his parent’s tree. Whatever you come up with, it will be great but just remember one thing, don’t forget to use a lot of light, my husband insists on over 1000. 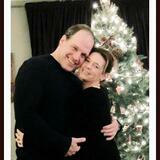 Suzie Canale lives in Westwood, MA with her 2 sons and husband. 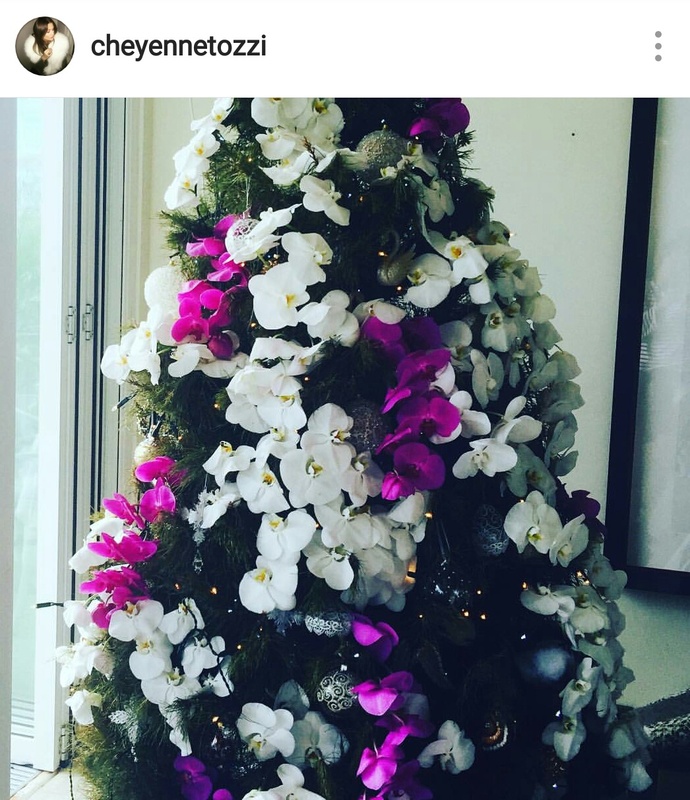 She decorates her tree on December 11th, her son Lance's birthday. What a great tradition. 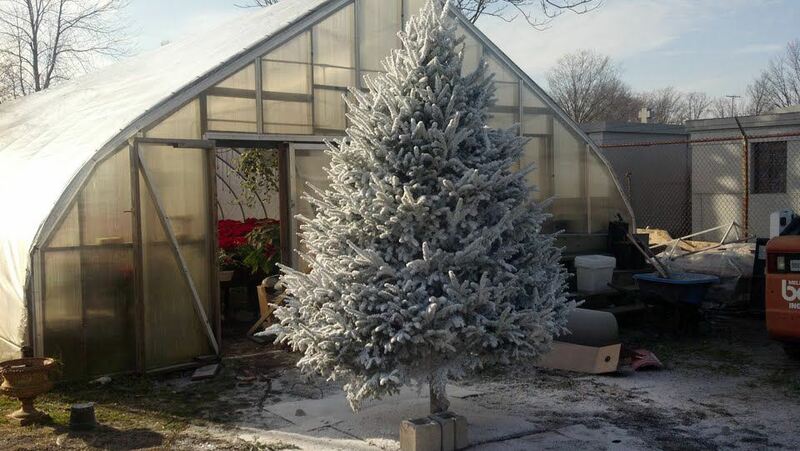 Did you ever want a Christmas Tree that looks like it should be in the White Mountains ? Snow flocked Christmas trees have been around for decades. My father has been setting up a snow flocked Christmas Tree for more than twenty five years. 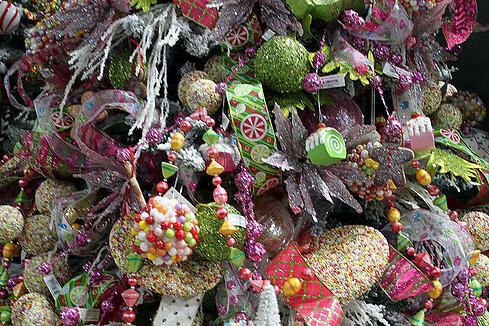 At Exotic Flowers in Roslindale, we have been making pink, blue, white and even black Christmas trees for years. While incredibly popular on the west coast, snow flocked trees are only favored by few in New England. The snow flock is applied by machine that is hooked up to a garden hose. Snow flock is water based, so one must allow adequate time for drying. 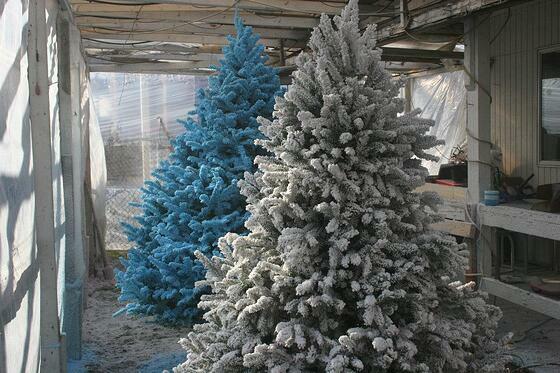 The process is best done in a heated enclosure to ensure the fluffiest snow look for your Christmas tree. Keep in mind, it is best to but Christmas lights with white cords if installing a white snow flocked Christmas tree. 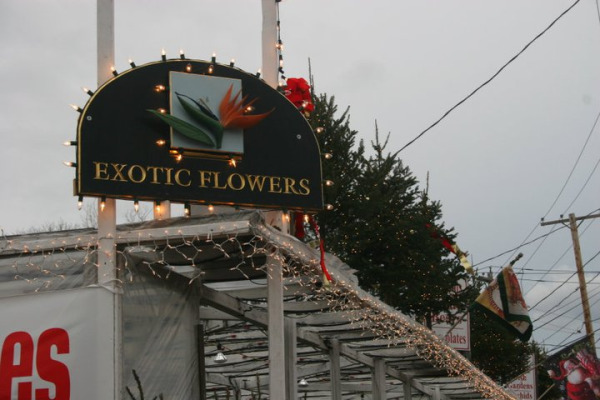 Since 1990, Exotic Flowers employee Paul Iantosca has been creating snow flocked Christmas trees for Bostonians. He offers his tips here. Your Best Tip: Have the lights put on before you flock your tree to camouflage the cords. If you want to try a custom snow flocked Christmas tree, make sure you order early. We do deliver snow flocked Christmas trees. Keep in mind you will not be able to pick them up when it is raining. Also, if you'd like to video record your own tree, please do.